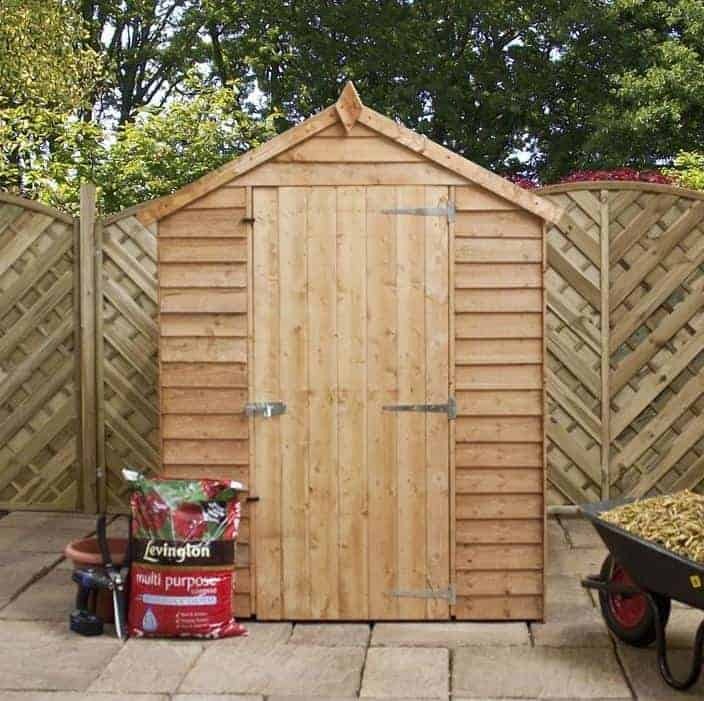 Prepare to be amazed by this low cost, excellent value overlap wooden storage shed. With a fantastic spacious design, this reliable and weather-resistant building provides a great place to store all of your outdoor essentials. 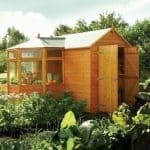 Built with 8mm overlap cladding, the shed has a great water-resistant build, though it will need to be treated to qualify for the 10 year anti-rot warranty. Like most modern sheds, this one comes with an apex roof and is covered in a heavy duty sand felt. The upside down V shape of the roof provides a lot of internal height, whilst also ensuring any rainwater drains quickly and easily off the roof. This prevents any damage occurring over time. Solid sheet materials are used for the roof and the floor. You should find these to be adequate enough to store light to medium weight tools and equipment. You also have the option to upgrade to a stronger floor if needed. Whilst this does come at an additional cost, it is a great investment if you want to store larger, heavier items. The shed comes with styrene glazed windows which are known for their excellent shatterproof design. You can also choose which side you want to install them on which we feel is a great additional benefit. The shed isn’t painted. However, this is a pretty simple problem to fix if you don’t like the rustic design. Coloured treatments help to add subtle colour changes, whilst a coat or two of high quality paint can help to really customise the shed in accordance to your preferences. 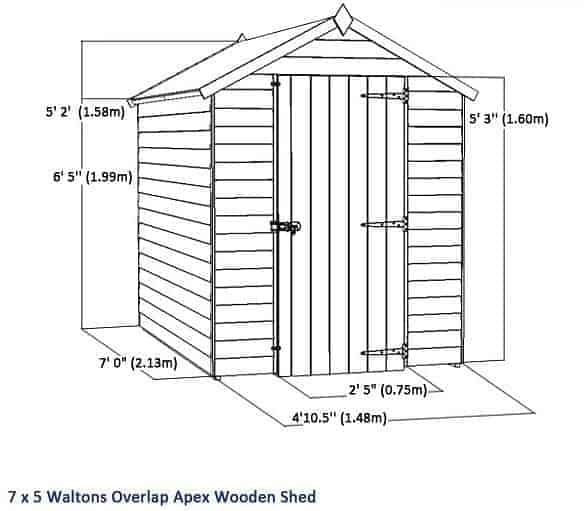 This apex overlap wooden storage shed is one of Walton’s best value models. Despite its affordable cost, it doesn’t hold back on quality features and the apex roof is a great example. Covered with mineral felt, the roof supplies a high level of water-resistance. It channels rainwater diagonally down and away from the building, eliminating any chance of it building up. This provides exemplary rot protection. It also gives the building a more spacious, taller interior. There is a lot of height situated centrally throughout the shed, making it possible to store slightly taller than average equipment. It is made from 8mm solid sheet board which you may feel requires a little extra support. 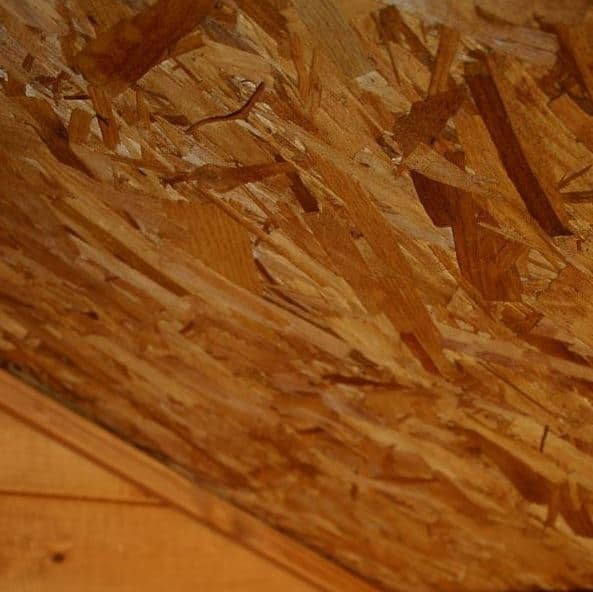 Roof joists will help to strengthen it, though they aren’t necessarily required. The height of the roof measures 1.99m and the tall eaves measure 1.58m. 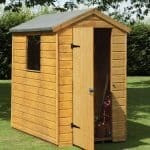 It is a medium sized shed with a width of 1.48m and 2.13m in depth. The double doors have been built to measure 0.75m in width and 1.60m in height. 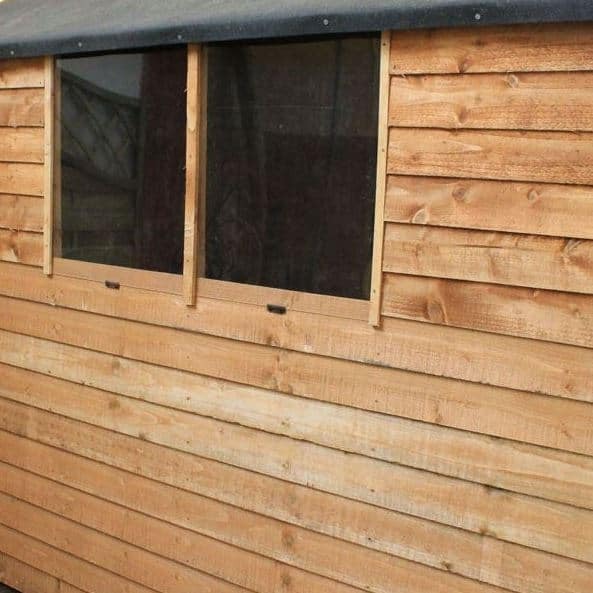 8mm overlap cladding has been used in the construction of this shed. Now if you research into the different cladding types, you’ll quickly learn that overlap is the cheapest and therefore the least durable out of the three main types used by manufacturers. It’s easy to assume that this means it will provide a low quality design. However, we were pleasantly surprised just how sturdy and reliable this shed is. The distinguishing feature of overlap cladding is the way the panels ‘overlap’ with each other. They are nailed down on top of each other, creating a similar appearance to that of a garden fence. Though 8mm isn’t very thick, you will find that it offers great protection against the elements thanks to its overlapping design. However, it will need to be treated if you want the shed to last. The only potential problem you need to worry about with this cladding is the fact that it is more prone to warping. This is especially true when it is placed in a very sunny area. Therefore we recommend assembling it in a more shaded part of the garden. The frame is actually the same as what you would find in a tongue and groove or Shiplap clad shed. Measuring 28mm x 28mm, it offers a wonderfully sturdy support for the structure of the building. It is the floor that could pose a problem as it is constructed with 10mm solid sheet board. You can walk over it with no issues as it will support your body weight. However, there is a chance that it could sag or break if you try and store heavier gardening equipment and boxes. It is for this reason we do recommend looking into the extra strength floor support pack offered as an extra. It will give the floor a significant increase in strength and comes at a very affordable cost. It is absolutely essential that you treat this shed on a yearly basis. In fact, you will find it is one of the conditions stated by Waltons in their 10 year anti-rot guarantee. The company treats all of its outdoor buildings with a water treatment before they are shipped. However, this is a very short-term treatment that is only applied to protect the building during the shipping process. 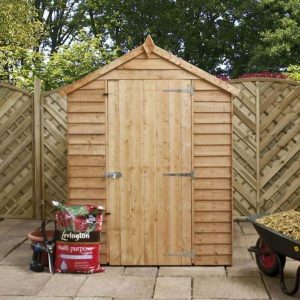 Either before you assemble the shed, or soon afterwards, you will need to apply another treatment to ensure it is adequately protected. So what treatment will it require? As it is an overlap clad building, a spirit treatment should be used. Whilst more expensive than water treatments, the spirit variations offer a much deeper, stronger level of protection. This is just what you need when the building’s materials aren’t very thick. 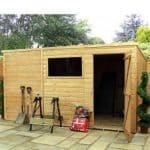 We also recommend continuing to treat the shed every year to ensure you are sticking to the conditions of the warranty. One single ledge door is included with this building and we like that Waltons have given it an extra-strong design. As this is one of the more ‘value’ sheds, we weren’t expecting much in terms of additional benefits. So the diagonal cross beams featured on the door to prevent it from sagging were a pleasant surprise. You’ll find even some Shiplap clad sheds don’t always include cross beams on the inside of the door. Whilst the width of the door is pretty standard, it does come with an extra-tall design which is great if you’re tall and often find you need to duck a little to enter outdoor buildings. It also makes getting taller tools into and out of the shed much easier. To complete the high quality design, a butterfly catch has been included. This won’t actually lock the door, but it will keep them shut no matter how windy it gets. The addition of two 2.5mm styrene glazed windows helps to add natural sunlight into the shed. They are medium sized windows and won’t open so they won’t provide any ventilation. However, the fact they are shatterproof is a great safety feature. Normally we’d be a little disappointed that the shed doesn’t come with much in the way of security features. However, when you take into account the low cost of the shed, Waltons can be forgiven for adding more basic features to the building. We do advise buying a lock to keep whatever you decide to keep in the shed protected. The good news is you can add a high quality padlock as an extra when buying this building. Privacy may be an issue as due to the weakness of the overlap cladding, it won’t support the weight of curtains or blinds. So we do recommend you don’t store anything valuable in the shed if it will be easily seen by passers-by. However, we should point out that as you can choose which side to assemble the windows on, there is the potential to ensure they are on the most private side of the building. This will potentially improve the privacy and is a pretty good feature the manufacturer has thrown in. 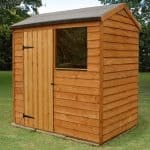 There is a very wide range of extras available with this shed, though some we found a little confusing and we’re sure you will too! So let’s talk about the slightly unique extras first. The PowaPost range of extras isn’t something you see advertised with the majority of sheds on the Waltons site. We also struggle to see why you would need them. There are 7 different accessories in the range and the reason they are so baffling is because they are designed to be used with garden fences. Take the 75mm Powapost Fence Post extender for example. This is designed to add extra height to fence posts, allowing you to add more decorative panels. Now as useful as these accessories are when you’re working with garden fences, they aren’t going to do much in terms of improving this shed. So we may be wrong, but to limit confusion we’d suggest you don’t need to worry about these extras unless you’re building a fence to make the garden more secure. However, not all of the accessories offered are a waste of time. There are five in particular we would highly recommend. The first is the extra strength floor support pack. Now obviously this shed has been constructed with value in mind. 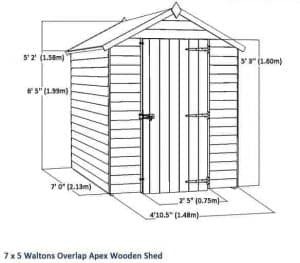 This means, as with many other sheds in the Waltons range, it comes with a solid sheet floor. This is great for light or medium weight storage, but it won’t be strong enough to accommodate lawnmowers or other heavy items. The extra strength support pack will boost its strength and enhance its storage capabilities. It is also really easy to install as the joists that come with the kit simply slot in-between the standard joists provided with the shed. One of the more unique extras offered is the 7×5 lean to kit. This basically extends the roof slightly on one side, providing an additional covered area. 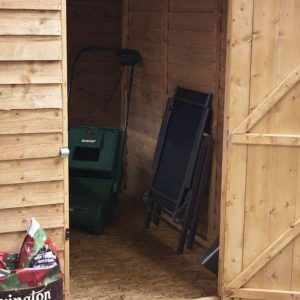 This allows you to store potentially bulky items that won’t fit inside the actual shed. Just be aware that only the top of the extra storage space will be covered, the sides, front and rear won’t be. So anything you do choose to store here should be weather-resistant. The 7×5 Portabase is one of the main extras we recommend. This is basically just a solid base that fits this shed perfectly. When building any outdoor building, it is very important to ensure it is constructed on a very firm and even base. If not, it can cause issues with stability and your shed may not last as long as it should. 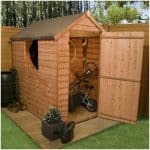 One extra benefit of this base by Waltons is that it also helps you to construct the shed much quicker and easier. As your storage space is limited and the overlap clad walls don’t support the weight of interior shelving, the tongue and groove shelving sets could be a fantastic investment. They don’t attach to the walls. Instead, they slot together and stand independently on the floor of the shed. We really like these sets by Waltons as the quality is absolutely fantastic. They are built with 16mm tongue and groove timber which has been planed to leave a smooth finish. The strength of the materials means you can store paint tins, toolboxes and heavy gardening equipment on them with ease. You’ll find 3ft, 4ft and 5ft kits available, with most offering a double tier storage solution. However, there is one 4ft set that provides 3 tiers. The weatherproof 49mm padlock is definitely one extra we recommend. There is no existing lock on the building so this useful, affordable extra will help to give you peace of mind. It even benefits from double locking and is armed with all kinds of weatherproof benefits including a brass cylinder, protective cover over the keyhole, a Thermoplastic weatherproof jacket and a steel laminated body. Other extras include superior duty felt which is made from thick, strong fibreglass. 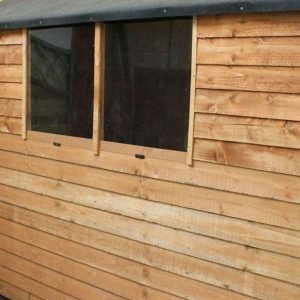 It is available in two different colours and is made to be a lot stronger than the heavy duty sand felt included with the shed. We feel this is more of a personal choice extra as the heavy duty felt is more than capable of withstanding the harsh British weather. There’s also a range of timber treatments on offer which you do actually need. However, you could choose to buy a treatment elsewhere. The advantage of buying one from Waltons however is that you know it will be a high quality preservative and it also saves time and hassle as you’ll receive the treatment at the same time as the shed. Although this rating may seem a little low, it’s actually really good for this basic, value shed. There may be a few areas which could be improved on, but the overall quality is great for the price you pay. Overlap cladding is reliable and strong enough to take on the harsh UK weather once it has been treated. 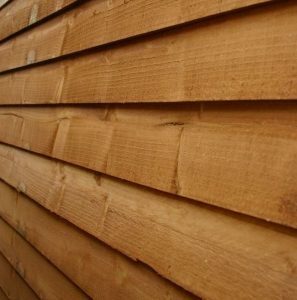 However, it is more prone to warping and compared to tongue and groove or Shiplap cladding, it won’t last as long. The shed offers a good amount of floor space, though without the extra strength support pack you are limited to what you can actually store. You also cannot install shelving on the walls so this again limits its potential. However, Waltons do supply a range of extra storage options including the Lean to kit and standalone shelving sets. So if you’re willing to spend a little extra money you can increase its storage potential. You’ll be pleasantly surprised with just how easy this shed is to erect. It should only take a few hours and the instructions are clear and easy to follow. We can’t fault the shed in terms of value for money. 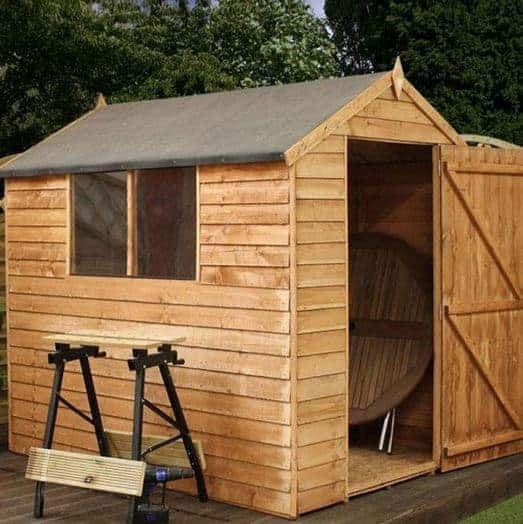 It comes at an incredibly low price, yet it is still better quality than many more expensive sheds from the company’s competitors. 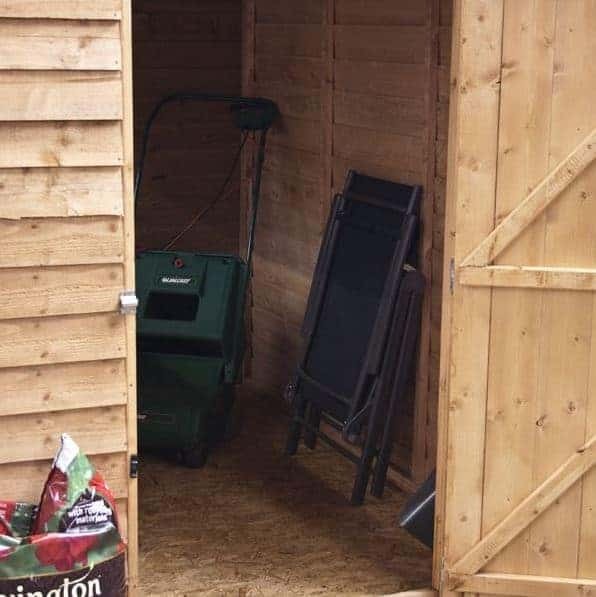 If you’re searching for a budget shed that offers great quality features then this is definitely one to consider. Final Thoughts: We really like that despite this being one of the lowest priced sheds on offer, it actually comes with some pretty great features. It provides exemplary value for money and is great for those looking for a simple, spacious storage facility. Upgrades are available to make the shed more suitable for heavier storage and despite being made from one of the cheaper forms of cladding, it requires just the same treatment as thicker, more expensive cladding. The shatterproof styrene glazed windows allow a good amount of light into the building and providing you do maintain regular treatments, you’ll benefit from a 10 year anti-rot guarantee.